But first, I’m going to talk about my most important search optimization rule. My first and primary rule, when thinking about search engines, is never to do anything for the sake of SEO that screws up the experience for the audience. That cuts out some downright dumb behavior, like overstuffing your content with keywords. But it also helps you evaluate new advice that comes along. If it makes your site less useable, if it makes your message less effective, or if it alienates or confuses your audience … you should probably skip it. Here are nine SEO recommendations that also work to make your site experience better for the human beings who read your content, listen to your podcasts, and actually pay for your products and services. Want lots and lots of people to visit your site, and stick around once they find you? Answer their pressing questions, and you’ll get your wish. People fire up a search engine because they have unanswered questions. If you’re smart and knowledgeable about your topic, you can help with that. Why is [the thing] so hard to get started? How competitive is [the thing]? How can I get motivated to do more of [the thing]? Is there a community of people who want to talk about [the thing]? Where can I share my own stories about [the thing] and read other people’s? Hand in hand with answering real audience questions is using your audience’s language. That brings us to our friend keyword research. It’s too bad that some people still think keyword research means looking up a bunch of word salad that makes sense to rooms of computers in Silicon Valley. Keyword research means figuring out the language that real human beings enter into search engines to find your stuff. By the way, you don’t have to feel chained to a narrow set of word combinations that you found with your keyword research tool. Use the keyword phrases you find, absolutely, but don’t use them so much that it gets weird. You don’t have to do an in-depth study of latent semantic indexing — just use synonyms. Use metaphors and analogies. Use a few big or unusual words (if they’re natural to your voice). Flesh out your list of keywords with all of the fascinating and creative things that writers and artists do. Content and SEO experts love to write articles about precisely how long your content should be. Over the years, the recommendations have gone up, and then down, sideways, and any other direction you might think of. My advice: your content should be as long as necessary to make your point. Some ideas can be expressed quickly, with punchy, interesting little posts. A strong series can be repurposed into ebooks (or a whole ebook library, once you have a solid archive), podcasts, infographics, SlideShares, videos, and premium products like courses. It doesn’t matter how brilliant your content is — if it’s published in walls of tiny gray type, without subheads or line breaks, most users will skip it. It’s actually really simple to take a strong piece of writing and make it much more accessible by formatting it well. Make sure everything on your site is easy to read, watch, or listen to. Give everything a clear call to action, so people know what to do next. And establish clear paths to the outcomes your users want … using smart content marketing strategy to present useful options at every point along the way. While we’re on the subject, if your site looks like it was published in 2003, you need a makeover. Immediately. Premium WordPress themes are a massive bargain for the design expertise (and clean back-end code) they give you in a turnkey package. Also, users and search engines share a hatred of hacked websites. Use secure tools, including reputable themes and quality hosting, and a good monitoring service like Sucuri to make sure nothing funky is going on. Covering your topic comprehensively matters, but it’s not just about going deep. There’s also a real benefit to looking around and going wide with your content. What’s the context for your topic? Who else is publishing about it? What are the trends? What’s changing? How is the larger environment shaping what’s going on? Who do you agree with? Who do you disagree with? What do people need to know before they dive into your thing? Where do they start? Where do they go next? If you write about social media marketing, write about people who have given up on it. Write about people who haven’t started yet. Write about how the larger culture and worldview are changing social media … and how social media is changing the world. Every topic takes place in a larger context. If that context interests your audience, it should be part of your content mix. Link-building is one of the most important topics in SEO. Even if your competitors aren’t into the whole “co-opetition” idea, there’s a larger community that cares about what you do. But runners would link to him. Skiers would, too. And sites about staying athletic as you age. Think about the community of web publishers who have the audience you want. Develop relationships with them. Support each other. This isn’t, of course, about spamming people you don’t know and begging them for links. It’s about making yourself a valued participant in a larger ecosystem. One terrific way to build amazing connections (and the links that go with them) is to publish guest content on excellent sites. Try it in a lazy, cheap way and it’s spam. Put the effort in to craft genuinely excellent material that serves their audience (and invites them to come check you out), and it’s a winning strategy. Good technical SEOs know all about creating a logical site structure that’s easy for search engines to parse. As I may have mentioned, I in no way resemble a good technical SEO. Instead, I rely on the Genesis framework and common-sense tags and categories to keep my site properly organized on the back end. But it pays to keep yourself organized on the front end as well. That means making sure your navigation makes sense for what your site looks like today, not two years ago. It means you take your most valuable content and get it somewhere people can easily find it. And it means you link to your best content often, so your audience naturally continues to find and benefit from it. You can do everything “right” for SEO and still get no traction. Why? Because no one links to you, no one visits your site, and no one recommends your content — it’s too similar to a thousand other sites. It’s boring. If your niche is incredibly narrow and no one else can write about it, maybe you can get away with boring. Even then, it’s risky. And the final SEO tip? Don’t try to make the search engines your only source of traffic. Relying on one source of customers for your business is unacceptably risky. Relying on a monolithic megacorporation as your one source of customers is insane. Google doesn’t care about your business. Not even a tiny bit. Not even if you give them a lot of money every month for ads. Make sure there are lots of different ways that potential customers can find you. Keep your eyes open for new opportunities. A platform that was a dud for you last year might offer a lot of promise today. And keep growing your email list, so if you do have a traffic hiccup, you still have a way to reach your most loyal audience. While search engine optimization shouldn’t be the only way you get traffic, it can be an important way for great people to find your site. Luckily, Rainmaker Digital CFO Sean Jackson wrote an excellent free guide you can download right now — and you don’t even have to enter your email address. Image source: Jill Heyer via Unsplash. Thank you for the print option! Call me a geezer, but I always prefer to read information-rich articles on paper. I am actually trying to get new people to my blog. It is not an easy task, and getting Google traffic is probably the most time consuming. I don’t go out of my way to write posts to attract traffic, but I do try to get links and post links. At this rate it will probably take forever. I figure once I have some reasonable traffic, maybe my readers will help with the links, you never know. This is indeed an informative post. As someone rightly said, we should write for people and optimize for search engines, I completely agree with you that we shouldn’t rely solely on SEO. If content really addresses the issues of a buyer persona, it can be viral on social media. I really liked reading this post. 1. Internal links (links on your website that point to other pages on your website) have been recently proven to matter a whole lot. Search Copyblogger for “cornerstone content” to see a solid internal linking strategy that’s nice for bots and humans. If you want a post to rank, but the only internal link to it is from page 3 of your archive, you’re doing it wrong. 2. Publish dates matter to Google, maybe way more than they should. Make sure your posts have visible publish dates and don’t feel shy about updating old content. Fresh, quality content gets “auditioned” by Google near the top of search results. If users react positively then your page may stick at the top. Constantly updating your content is also good for users. Find new information? Quoted an outdated stat? Your post deserves to be pruned to remain evergreen. 3. Publish on Medium. Building your home on rented land is bad, but Medium has a technical feature that can benefit you. Medium posts can use a “rel=canonical” defence to point back to an original post on your site. This is the Google approved way to repost duplicate content on other sites. Google will display your original content over your Medium repost, and will count links to your Medium post to your original post. This is good for users because they can discover your content in Medium, without you polluting search results with duplicate content. You can even gain external links to your Medium post from people who may be hesitant to link to your more commercial site. 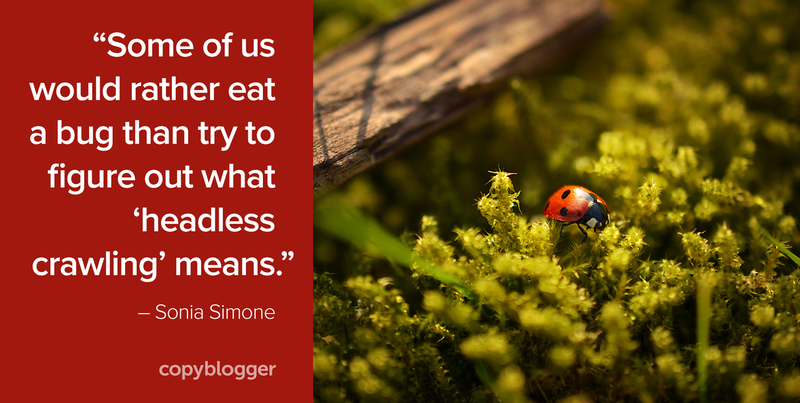 Thank you, Sonia, for taking a topic that strikes fear in the heart of many newer bloggers and taming it down to size. And, Hashim, it’s always a delight to see your added twists on topics in the comment section. I’m the SEO bug-eating type as well – and you’re right in that content really is king. It’s always a great idea to optimize your website for SEO, but too much SEO focus can potentially take away from the user experience. Thank you for reminding me that Google searchers are not my one source of traffic! Sonia, SEO is a technical topic but I liked the way you explained it in an easy language, something I can easily understand and can relate to. Thanks for sharing the tips. “Linkbuilding is community building”. And that’s indeed what it is. I see too many SEO’s solely relying on their PBN. They spend quite a lot of money on chasing expired domains / websites and don’t put time or effort in community building. I place about 20% of links on my PBN, but no more. It’s thank toy community-building that I got my #1 ranking on “seo-copywriter” and #2 ranking on “seo-copywriting” in Google.be after 1 year. The links are strong, relevant, come from trusted sources. Also, guestposting is very powerful in my experience. Any scheme to game real links will fizzle eventually. Real links from real sites with real readerships will lead to actual human contact (and business). The search rankings are just a helpful part of that larger puzzle. SEO is a topic worth spending the time to think about. But the main concept is to keep your audience engaged. You can’t rely on the technical SEO. What would you get if your readers wouldn’t understand your point? Creating a user-friendly environment will bring more visitors and the SEO of your blog will automatically increase. Locusts are the only insects that are kosher. I find SEO reasonably interesting (but I also watch documentaries about serial killers and cold cases so I’m not a good judge) but I love all of your points about focusing on useful content, rather than just playing the Google game. I get most of my traffic from social media because I, you know, talk to people. Thank you, Sonia! This is a great post that goes back to the most important thing about SEO: it’s about helping people find what they’re looking for. I always write with the “reader first” mindset. Then, I might optimize for SEO, in the traditional sense, but if it’s good for readers, and helping them, I believe it’s also good for Google. Because, after all, isn’t Google trying to discover how people search and trying to find the best info for them? I think keeping this in mind always lowers the SEO frustration. “Write about the whole picture.” This tip really triggered some ideas for me, Sonia. Funny how I can think about content all day and forget the obvious stuff. Thanks for herding these important ideas for common sense people. SEO can get so wonky, when it’s really quite simple. I’m one of those people who geeks out about SEO. What you said about keeping up those wily engineers at Google describes me well. I’m grateful that you wrote about how SEO and writing can go hand in hand. I came to SEO probably the opposite of most, from copywriting and content marketing. In some ways I count that a blessing. Like you said, it’s all about creating content for the user and In their vernacular. Google’s algorithm seems to getting good enough these days that the only way you can rank well is to create quality content that will engage users. Basically what copywriters already do. In my opinion, the SEO industry is going to need a lot more copywriters as search engines become more advanced at returning relevant results. Thank you Sonia for your post. I feel myself… in your field. I agree that SEO is important if it helps us to write content useful and appreciated by our audience. In Italy there is a website which gives advice about everything connected to the internet or computer problems. It’s successful but… reading their text is, for me, like a torture. It offends Italian language repeating and repeating the keywords in an boring and annoying way. I don’t want, Sonia, to believe that SEO is an irritating way to get searching readers. But a nice way to care our audience. That’s why I wish to thank you, and Brian Clark and the Copyblogger’s team, for helping us to work for true people. Not for stupid computers. Despite Google never explicitly saying it, SEOs have reason to believe that on-page ‘engagement’ is a ranking factor. However, there is a distinct difference between a ‘pogo stick’ (when someone clicks on your site, only to click back to the search results, and click on a different result) vs. a satisfied ‘bounce’ (someone found the answer they were looking for on your page and left without needing to look elsewhere. You’ll notice Google trying to satisfy searchers with quick answers via featured snippets (Answer Boxes ^ People Also Ask Boxes) in search results. What SERP (Search Engine Result Page) features there are for the query you are trying to answer? If you discover some answer boxes popping up, dig into that ranking page’s content and format your answer similarly (bullets, list, paragraph, table, etc.). It’s also smart to add a strong call to action at the end of your answer for something that particular searcher might also be interested in. This can help lower bounce rate, increase page views, increase conversions, increase time on site, etc. Pro Tip: Refurbishing your content/answer for unique use cases can also give you a big leg up on competition! As a marketer, I want to say with all my heart that great content is going to make an impact and blow people away and rank on its own merit etc, etc, etc. But I often get the feeling that the battle is too uphill for most SMEs to be able to make any sort of headway. With all the content that’s published on a daily/hourly/minute-ly/second-ly basis, I wonder how hard someone who knows the most about a subject, who deserves to be listened to, REALLY has to work to get their content in front of people. If marketers, people whose job it is to make this stuff happen, struggle with this, how hard is it for the average business owner? How hard is it for the average blogger? How hard is it for the scientist or the engineer or the doctor, the people whose opinion we should probably be listening to a lot more closely than the marketer who once talked to an engineer for fifteen minutes and then wrote a 2000 word article on a subject they don’t understand on even a basic level? Is it even worth trying? Are marketers doing the world a favor by writing content about subjects on which they are NOT experts? With so many professional writers and SEOs out there flooding the market with targeted, well-written, content, how can actual SMEs (who may not be the best writers) get noticed? I feel like their content is going to be much more valuable than the content of a marketer (for the SMEs’ area of expertise), but they’re ultimately going to disappear under a mass of optimized content written by people who know much less about the subject and much more about SEO and content writing. I can’t tell you how many times I’ve researched a subject within a few client niches and come across an incredible amount of useless junk that is ranking because a marketer wrote it, only to find that the most valuable content was buried because the SME didn’t pick the right keywords or wrote giant blocks of text or was missing an H1. If we’re talking about content related to something innocent like sandcastles it’s probably not a big deal, but when articles written by SMEs in the healthcare industry, for example, are getting pushed down by content written by marketers, I really start to wonder how good that is for society. Not sure I have a question at this point, ha! Or maybe it’s this — what’s a SME to do who doesn’t have access to (or the time to learn) all these techniques? Who is just never going to be a great writer or an interesting writer (but who still deserves to be listened to)? Are marketers really doing the world a service by just pushing content to the top of a SERP? Is there an ethical dimension to all this that we’re missing?